Rio Rancho Art Association: Nina Baldwin Wins Poster Contest! Kudos and congratulations to RRAA member, Nina Baldwin, whose poster design was chosen as the winning design for the 2008 New Mexico Conference on Aging. "This poster is a visual of the conference theme “A Diverse Community; Exploring Options, Expanding Horizons”. The hill is comprised of many different fabrics representing the different cultures in New Mexico. Starting at the top of the hill, the Mexican serape, of course, represents the Hispanic culture, and going clockwise, the blue fabric with feathers stands for the Native American population. The Asian people are represented by the red fabric with flowers. Continuing clockwise, the African- American culture is illustrated with a bold geometric pattern. And completing the hill, the Anglo population is represented by a red plaid. 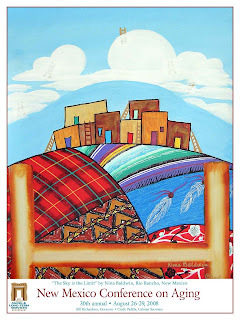 The different colors and textures highlight the differences in our cultures, our “diverse community”, but united our cultures make a beautiful tapestry… TOGETHER WE ARE THE FABRIC OF NEW MEXICO!!! At the top of the hill stands a pueblo scene with many buildings with many different colored doors…this illustrates the many options we all have as we explore the services, educational opportunities, agencies, social events, medical options and life-changing possibilities available to us as we age. Ladders assist us to even more exploration. The clouds represent our expanding horizons as we take advantage of the options available to us. Can you see the ladders in the clouds? They assist us on our journey…to greater horizons! Truly, for all of us, “The Sky is the Limit”! I am honored to have my artwork chosen for the 2008 Conference on Aging Poster! Thank you!"